We love contests, even when we know our odds of winning aren't good. And we really love contests when they involve giveaways for gear that we want but maybe can't afford (or want to splurge on) or race entries especially when the race is a tough one to gain entry into. So if you're OK with testing your luck, and running a marathon--and one that's on many a runner's bucket list, including mine--in the fall, Nissan's Innovation for Endurance program has a contest you want to enter. More like, you need to enter. It's a race that's been run--and won--by Meb Keflezighi. It's been the debut marathon for Kara Goucher and Shalane Flanagan. And it's going to be run by Ryan Hall a mere 12 weeks after he tackles the Olympic marathon in London. That's a lot of Olympians who've tackled the five boroughs of New York City to finish running 26.2 miles in Central Park at the ING New York City Marathon. For the rest of us, we have to be super speedsters who can get into this infamous marathon based on time, register for the lottery and get lucky, or get unlucky in the lottery enough times that we're finally allowed in, or run and volunteer at a handful of NYRR events. 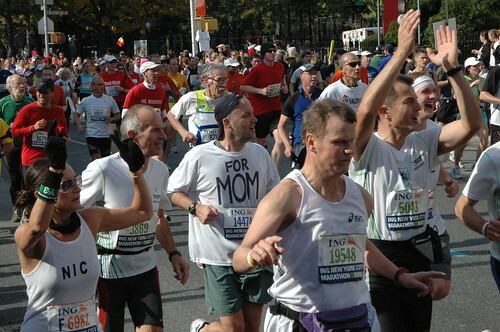 The ING New York City Marathon is tough to get into--and that's without hitting a specific qualifying time like you need for Boston. But that's where Nissan's Innovation for Endurance program steps in. They're giving away two entries to this November 4 race and all you have to do is enter online. Not only do the two winners gain a coveted marathon spot, but they also get their airfare and hotel accommodations paid for, an official training program, weekend transportation in a Nissan vehicle that includes transportation to the Staten Island start line, a Saturday shake-out run with a Nissan athlete, and VIP tickets to the pre-race pasta party and post-race celebration. And based on the athletes who share tips with Innovation for Endurance--Ryan Hall, Ryan Lochte and Chris Horner--I can only imagine that the shake-out would be a pretty cool experience. Guess that's why it's called the Golden Entry Sweepstakes. If you could give yourself a chance to run this 26.2-miler--and do it in star-studded fashion--wouldn't you try? I know I would--and am, even though I'll probably be a crippled mess considering I'm running the Bank of America Chicago Marathon not even a month before. But the days are dwindling down to enter. I missed the contest's first round--July 15 to 21--but the second one started July 22 and doesn't expire until Saturday, July 28. Want to submit an entry? Test your luck at facebook.com/InnovationForEndurance. Photo grabbed from Matthew Myers at flickr.